Rob and Akiva were back at it again this week to discuss the season two episode titled “The Jacket”. Akiva felt, while better than the season one episodes, it didn’t rank up there with “The Pony Remark”. Rob disagreed, pointing out how it was one of the first few examples of an episode that tied together the “A” and “B” story lines, which became a staple of future Seinfeld episodes. The opening credits with Jerry’s stand up was a bit about how Jerry dislikes clothes. He notes how in the future, everyone is always dressed in silver jump suits, and he’s on board with that. Rob noted how silver seemed to be the go to color for futuristic outfits, but in 2014, it seems to have gone to white. Akiva pointed out how Jerry seems to talk a lot about clothes for a guy who hates them. Akiva then proved that he actually is a person who hates clothes, since either his mother or wife have bought his clothes his whole life. The episode opens with Jerry and Elaine in a clothing store. They go on a riff about how there are no good clothes in the back, even though a salesperson will always say they’ll check in the back. Elaine says if the stuff in the back were good, it would be in the front already. Jerry concludes the riff with an idea of a store called “Just Back”. Rob brought up how he is always being mistaken for a store employee, having people coming up to him asking if there is anything more in the back. Akiva thought it has to do with Rob’s “All-American” look. Elaine, who is carrying a book with her in the store, has another shopper comment on how good of a book it is that she’s holding. Jerry brings up that Elaine’s father, Alton Benes wrote it. Rob wondered if Jerry was blowing up Elaine’s spot by bringing this up, but Akiva felt like he was bragging her up. The other shopper mentions how she thinks he deserves a wider audience, but Elaine says she doesn’t think he wants one. Rob thought this was a cryptic comment, which happens from time to time throughout the series. After the other customer leaves, Elaine reminds Jerry that he is supposed to come to dinner with her and her father so he can act as a buffer. Jerry isn’t thrilled, mentioning to Elaine that he prefers the company of nitwits. While browsing, Jerry notices a great looking jacket that fits him perfectly. When he asks Elaine about the price, she tells him there is no ballpark for his idea of how much it costs. Jerry looks at the price, then has dueling thoughts about whether to buy it, ultimately deciding “What’s money?” and makes the purchase. Rob read an email question asking them how much they think the jacket costs, and what is the most they’ve spent on a jacket. Akiva felt the jacket was around $1500, while Rob had figured it to be around $1100. Rob went as far as inputting what an $1100 jacket in 1991 would cost today, which turned out to be $1924.94. The most Rob ever spent on a jacket was $250 while in Argentina in 2003. The next scene is back in Jerry’s apartment, where he is wearing his new jacket while sitting in his pajamas. 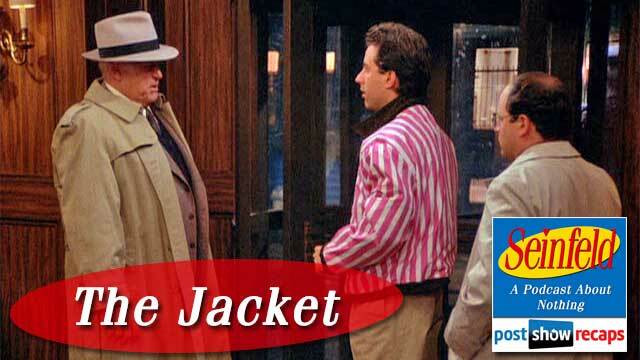 Kramer comes in, notices how great the jacket looks, and starts badgering him about what it costs. Jerry tells him “I paid what it costs”. Kramer notices Jerry’s old jacket hanging on the hook, and goads him into giving it to him. Akiva and Rob discussed how they both feel tentative when discussing what things cost, and how society seems to generally feel the same way. Akiva noted that Jerry seems to see a lot of his money go down the drain, from losing all his $2500 in “The Stock Tip” then this ruined suede jacket here. They agreed they should keep a running tally throughout the recaps. George comes into the apartment after Kramer leaves, singing “Master of the House”, a number from the play Les Misérables. He tells Jerry how it is stuck in his head, and has been taking over his life. Jerry mentions that Schumann went insane from a single note being stuck in his head. George doesn’t know who this is, and tries to play it off by saying “Oh, you mean Schu-Mon”. Rob asked Akiva the last song that got stuck in his head, which Akiva, much like every other parent of young girls, answered the soundtrack from the movie Frozen. Rob pointed out this scene as an example of the great interactions between Jerry and George, one of the cornerstones of the Seinfeld series. Akiva felt that their relationship is on point. Back on the episode, George notices Jerry’s jacket, and says with a staunch record of heterosexuality, “It’s fabulous”. He tells Jerry he won’t ask how much it costs, then proceeds to hound him with speculation of how much he spent. Kramer comes in and asks Jerry to do him “a solid”. He has to pick up some birds that he is looking after for a friend, but it would be just two minutes. Since he and George are headed to dinner with Elaine and her father, they can’t; plus, Jerry knows that “two minutes” to Kramer is more like an hour. They get to Alton Benes’ hotel, where they are to meet him and Elaine. George, still singing “Master of the House” is reminded by Jerry about Schumann’s insanity. Neither are enthusiastic to meet the intimidating Alton Benes, and it’s immediately clear why when they sit down with Elaine’s gruff father. Akiva shared something he read about how the character of Elaine’s dad was based on the father of a woman Larry David dated named Richard Yates, who wrote the book Revolutionary Road. The awkwardness begins when Jerry and George order nonalcoholic drinks, much to the chagrin of Alton, who orders a scotch. Rob pointed out that we rarely if ever see Jerry drink alcohol. George and Jerry continue to have a difficult time striking up any conversation with Alton, getting nowhere with any of their small talk. Alton makes mention to Jerry that he had a funny friend in Korea, who ended up getting his brains blown out all over the Pacific, and there’s nothing funny about that. Akiva then shared another story he read about Lawrence Tierney, the actor playing Alton Benes. The show regulars all talked about how insane the guy was, so much so that they had to scrap their plan of having Alton Benes as a recurring character, a la George’s and Jerry’s parents. Rob and Akiva both agreed that Alton Benes is not a character that the show missed out on having as recurring. Finally having both escaped to the bathroom, Jerry and George try to figure a way out of this. George suggests leaving, or just telling him they are frightened of him and have to go home. Jerry says that he’d clunk their heads together like Moe from The Three Stooges. George’s other idea is for Jerry to start itching, and to tell him he has crabs. Since Alton was in the military, he’d understand according to George. When Elaine finally shows up to the hotel, she shares with them how Kramer roped her into helping him with the birds he needs to pick up, promising her a ride to the hotel after. The two minutes Kramer promised turned into twenty minutes, then the police tow Kramer’s car because of thousands of dollars in back tickets. Jerry tells Elaine that she should have known better than to trust Kramer, but she was sucked in by the promise of a ride. Her dad comes back from the bathroom, and gives Elaine a greeting about as warm as he did for Jerry and George. He briskly asks about her mother, calls her employers at Pendant Publishing bastards, and comments on her wearing lipstick. Rob and Akiva point out that this is the first mention of Pendant Publishing, and pondered whether Elaine wearing lipstick was a subtle way of showing that Elaine still has a thing for Jerry. They all get up to walk down to the Pakistani restaurant. Rob wondered if it was Babu Bhatt’s restaurant, since it was mentioned in that episode as being the only Pakistani restaurant in New York. The storyline all comes to a head as they make their way out the door. George starts singing “Master of the House” again, but is quickly told to “Pipe down, chorus boy” by Alton. With the snow starting to fall outside, Jerry worries about his new suede coat, and turns it inside out. The lining of the coat has pink stripes, which causes Alton to tell him there is no way that he’ll allow him to walk down the street with his daughter dressed like that. Back at Jerry’s apartment, he’s wearing some kind of high school letterman’s jacket. Kramer comes in to take some mini Ritzes for the birds he’s watching, and asks him about the suede jacket. Elaine pops in, and tells Jerry that her dad had a great time at dinner, which is surprising, since he usually hates everybody. Kramer takes the ruined jacket off his hands, and points out that it’s too bad that Jerry gave him the old one too. Akiva noted the hilarity of Kramer not having the awareness to give the old coat back. In the last scene, Alton Benes is driving home when he starts singing “Master of the House” himself. Akiva said that this was the first scene in the series without Jerry in it. The closing credits’ stand up has Jerry telling a joke about leather getting ruined when it gets wet. He wonders how come cows don’t have to get under cover when it rains. Akiva and Rob discussed how this episode would be different in 2014, both deciding that it would be less fun now. Jerry would certainly be able to find a better deal for the jacket online. Plus, George and Jerry could have texted Elaine like crazy when she didn’t show up on time. Rob read one last email from a listener who answered a question Rob and Akiva had from a previous podcast about whether George is an only child. George mentioned having a brother in an episode in season three. Tune into Seinfeld: A Podcast About Nothing next week as Akiva and Rob will dissect “The Phone Message”. 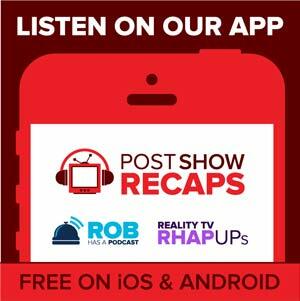 You can find all the recaps of Seinfeld and other shows at postshowrecaps.com. Follow Akiva on twitter @Keev26 and Rob @robcesternino. Special Thanks to Mike Moore for this week’s episode recap.